UNITED NATIONS (CNS) — St. Teresa of Kolkata was described as the human face of eternal hope who embodied the founding principles of the world body during a program honoring her canonization. The saint also offers an enduring example of what the U.N. can achieve, said Archbishop Bernardito Auza, the Holy See’s permanent observer to the United Nations, one of the speakers during a Sept. 9 event that marked her canonization five days earlier in Rome. 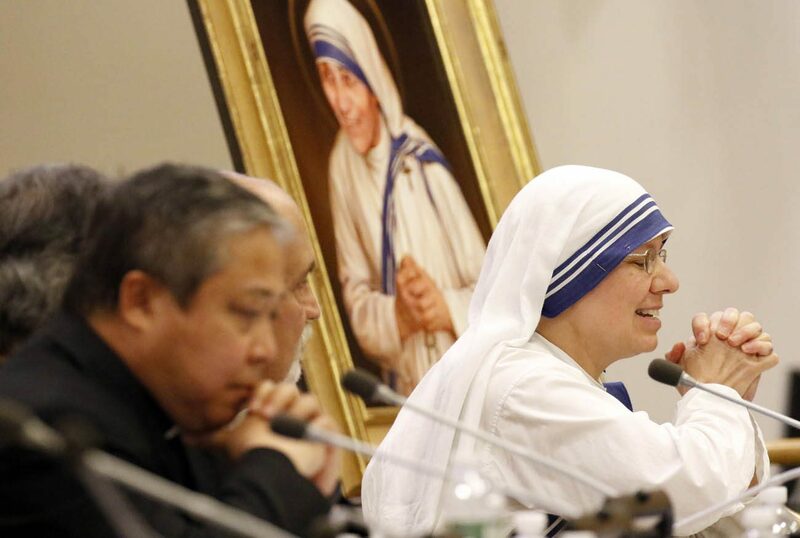 Mother Teresa was perhaps the first person since St. Francis of Assisi who was considered saintly by people of so many countries and religions, Archbishop Auza said. Alan Sears, president of ADF International, a co-sponsor of the event, said Mother Teresa used joy as a net to catch souls and demonstrated courage by giving up her anonymity to speak out for those who could not. “Mother Teresa lit the path to a more hopeful future by faith in God, love for the poor, courage in the face of evil and apathy, and her unquenchable joy in the midst of pain,” Sears said. Father Leo Maasburg, an Austrian who was a close friend of Mother Teresa, noted how the depth to her personality seemed to be transmitted by osmosis. British author Kathryn Spink worked with Mother Teresa. She traced the biographical details of the saint’s life and her persistent mission to minister with love to the unwanted and alone. Spink recalled Mother Teresa’s December 1985 “Miracle in Manhattan” where New York Gov. Mario Cuomo granted her request to release dying prisoners to a hospice she established to care for people afflicted with AIDS. “Mother Teresa was one of the most countercultural people of the 20th century,” said Father Daniel Jones, associate professor of theology at Sacred Heart Seminary in Detroit and a retreat leader for the Missionaries of Charity. Father Jones said Mother Teresa directed her peacemaking activities to “concrete, individual persons” and saw service as a route to peace. He said her self-assigned task in the congregation’s convents was cleaning toilets. It is a “sad paradox” that a woman who ministered to dying strangers in other countries “could not offer solace or comfort to her own mother before she died,” Kadare said. In the years since the fall of communism, an airport, university and main square in the country’s capital have been named for Mother Teresa. Ambassador Syed Akbaruddin of India said Mother Teresa was remembered and valued as “one of our own” and personified the Indian worldview, “All the world is our home and all humanity is our kin.” While most of India did not share her faith, she was considered a saint in India in her lifetime, he said. Sister Clare Roy, a Missionary of Charity in the Bronx, said Mother Teresa did not love from a distance and demonstrated a mother’s love and tenderness by leaving no one behind. She said the congregation continues Mother Teresa’s work with the abandoned, lonely, elderly, sick and homeless in New York. “It’s Kolkata again, here in New York,” she said.